Gary Mauris might have the most recognizable face in the entire Canadian mortgage industry. Coming seemingly out of nowhere, Mauris and his partner Chris Kayat founded Dominion Lending Centres in 2006, and have built it into a respected force within the industry. Today, Dominion Lending Centres has thousands of brokers working in the network and has become a household name for millions of Canadians. So where did Mauris come from? A serial entrepreneur, he ran two massively successful companies before entering the mortgage space, first, an equipment manufacturing company, which he eventually sold to Rothmans, Benson & Hedges—and then became one of the largest ATM providers in Canada. After selling to DirectCash, Mauris set his sights on the mortgage industry after having a conversation with a neighbour down south. Mauris and Kayat founded DLC 13 years ago and built it into a paragon because they understood mortgage industry brass tacks and because they know that DLC’s brokers are the most important facet of the operation—and, therefore, need to be treated as such. Anybody who knows Mauris will tell you he’s a brash straight-shooter, but not many know about his softer side. 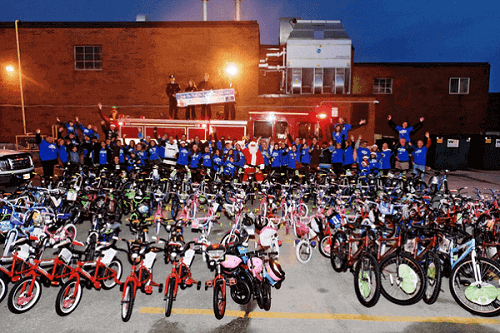 The DLC Bikes for Kids program has collected and given away about 9,000 bicycles to underprivileged kids, and Mauris counts it as among his greatest achievements.